The Caring and Sharing group met at Aspendale Gardens on 23rd January 2015. Fifteen ladies arrived ready for a prompt start on the Friday morning. 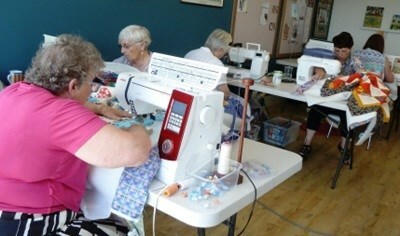 The day’s sewing was only interrupted by lunch enjoyed in the Village’s restaurant overlooking the lake. A variety of beautifully presented meals were enjoyed before we resumed our quilting activities. Quilts had been basted ready for quilting & during the day eighteen quilts were worked on, with many being taken home to be finished. 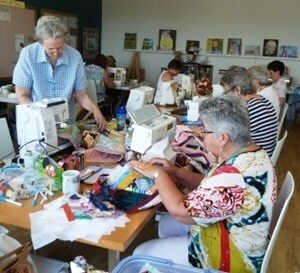 Our thanks go to Richfield Village Management for allowing us to use their craft room & providing the extra tables, also to Margaret for arranging the use of the facility for us. 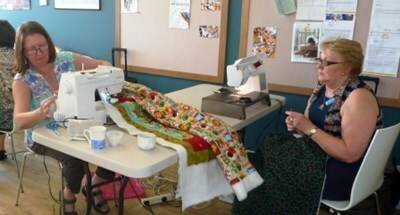 Thanks are also due to the behind the scenes activity of basting the quilts ready for the day’s quilting. Thoroughly enjoyed this day. My first for Caring & Sharing. The company was friendly and the lunch excellent. Looking forward to the next one.